The notion of a jock, a grind, a beauty queen, a burnout, and a large, anthropomorphic canine piling into a detailed van to solve mysteries has proven indisputably, irresistibly evergreen. In the 46 years since Joe Ruby and Ken Spears co-midwifed Scooby-Doo, this franchise has become a cross-media juggernaut so imposing that it’s easy to forget how shaky its early footing was. Decades before property-splintering was standard operating procedure, television executives were reshuffling and repackaging the adventures of Scooby, Velma, Fred, Daphne, and Shaggy with a turbo-charged cynicism that puts today’s Marvel Comics and Hasbro shenanigans to shame. 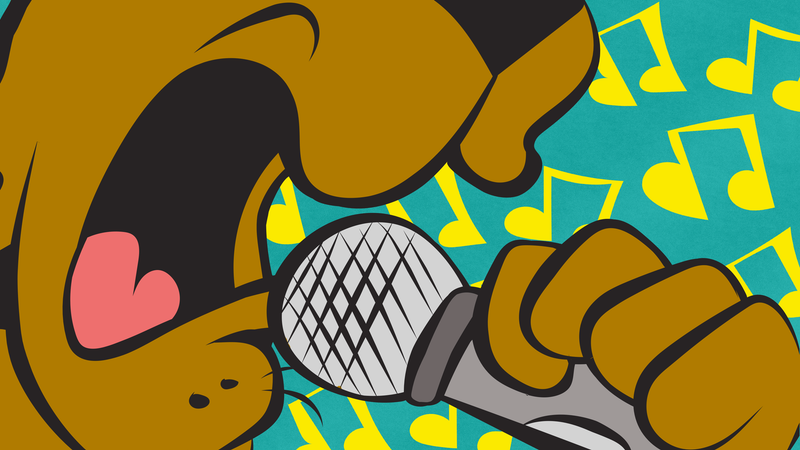 There have been 14 Scooby-Doo iterations on TV alone, each one demanding a fresh new theme song to reintroduce the franchise to a new generation or sub-generation. I listened to these themes over and over again. Here are my findings. This sub-Wacky Races lead-in is arguably the nadir of Hoyt Curtin’s compositional career: splashy horns rip off The Newlywed Game, a chuckle-headed sportscaster prattles on and on, and effects scatter like birdseed. Jake Monaco, who has scored or co-scored a handful of movies you’ve never heard of, serves up a curt, unmemorable 18-second theme for the post-post-millennial Scooby set. If not for the eye-rolling Scooby dooby doooooooooo tacked on at the end—the sole concession to exposition—this thing could’ve surfaced anywhere: a bothersome pop-up ad interrupting a video-game app, the pre-movie infomercials nobody pays attention to, etc.. It’s like an anti-theme. A overtly saccharine, forgettable take on prior themes. I couldn’t locate a songwriting credit for this one, probably because—understandably—no one longs to be associated with it. Lightning booms; jagged, scary horns sound. Then Lennie Weinrib’s Scrappy Doo introduces himself to Messick’s Scooby, and things get really frightening, as Scrappy’s already tiresome Napoleon-complex schtick swallows the theme whole. This is instructive; this is a warning. But who, you ask, is responsible? I retort: Who cares? Curtin and Dean Elliott cheese out an unimaginative rehash of the earliest Scooby-Doo themes, sliming in a Greek girl-group chorus who hail Scooby in a vaguely suggestive way. As the introduction draws to a close, dialogue from Scrappy-Doo, a roundly loathed abomination, surfaces. I gotta give Curtin his props for this one: For its first 20 or 25 seconds, this theme is legitimately frightening, in a “middle-school Halloween party” sort of way. Vincent Price vamping it up! Spine-tingling organ chords! Lightning-strike effects! When the floor is opened to the rest of the cast, everything goes south, underscoring the wrongheaded inanity of this particular series. Curtin, William Hanna, Joseph Barbera, and Ron Jones team up to Frankenstein Michael Jackson’s performative tics and the Ghostbusters theme into an opportunistic pop-culture nightmare that may move you to pummel yourself into unconsciousness. You’re probably thinking “shouty bargain-bin NOFX homage,” but the reality is “post-post Devo Mark Mothersbaugh.” This is painful-to-swallow craft—if admiringly direct, in lyrical terms—engineered by an ’80s rock icon who long ago figured out where his bread is buttered. John Debney would go on to an Academy Award nomination for scoring The Passion of the Christ. En route to that milestone, he composed this, which suggests Chuck Berry rocking a sock-hop. Fitting, somehow, for a deeply irreverent franchise reboot. Who could get mad at this one? Matthew Sweet—yes, the Matthew Sweet of Girlfriend and “Sick of Myself”—can claim credit for this spooky, vaguely psychedelic instrumental number. Startlingly brief, festooned with eerie keyboards, and punctuated with a sheepish scooby-dooby-dooooooooo, it does a better job of driving its point home than most of its brethren. What if Phil Spector had commanded Blink-182, at the point of a sharpened bayonet, to write and cut a Scooby-Doo theme in 10 minutes? We’ll never know the answer, but Simple Plan’s bratty, nth-wave punk number here is sharp and effective, even as it is wholly disinterested in capturing the essence of the show; I catch myself randomly humming this one far more often than I care to admit. Barbera, Curtin, and Hanna regroup here for a theme that departed from those of its two predecessors. The chorus line foregrounds Casey Kasem’s Shaggy character, whose interjections become part and parcel of a sales-pitch jingle spiced with effects. This theme went bombastically bananas in a way that makes its New Scooby-Doo Movies counterpart seem modest by comparison, so much so that you’d assume embarrassing digressions were afoot already; they weren’t, but the world certainly didn’t have long to wait. Suddenly this franchise was hot, and big time: The Harlem Globetrotters! Laurel and Hardy! Batman and Robin! So Curtin, Hanna, and Barbera flipped the epochal Scooby-Doo, Where Are You! theme into something boldly, orchestrally show-biz, jettisoning verses and spotlighting Messick’s scaredy-cat dissembling as the titular Great Dane. From those forebodingly turgid opening loops to that period garage-pop red meat, the masterful tone and economy of David Mook and Ben Raleigh’s camp OG Scooby-Doo theme cannot be overstated. Lyrically plain and dispassionate, this Monkees-esque theme perfectly mirrors the series it preceded: zestful, madcap, slightly rough around the edges. Singing along at home is almost as fun as picturing this earworm rattling around in Thomas Pynchon’s anonymous skull until he coughed it up as a reference in Inherent Vice. And thus the circle closes. Raymond Cummings is a writer and critic living in Lewisburg, PA. His work has appeared in Pitchfork, The Village Voice, SPIN, and Splice Today; “Vigilante Fluxus,” his latest collection of poetry, was published in February.